The brewery has become a behemoth of craft beer, though some hard-knuckled enthusiasts would not consider it as a true craft beer since it became part of the Duvel family. However you classify it, Ommegang is producing some outstanding beer. And the brewery's onsite cafe has mastered the art of incorporating beer into food. One example of this is the Daily Moules ($12), which vary season to season based on availability of ingredients. 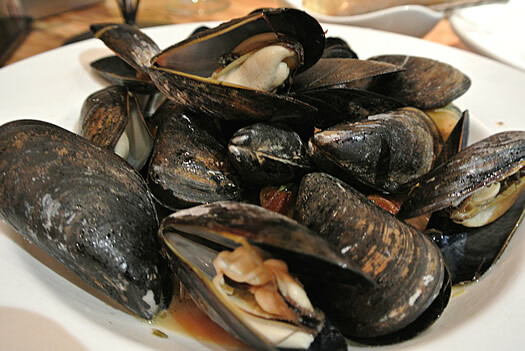 Most likely the mussels come steamed in Hennepin or Witte, two flagship offerings from the brewery. The addition of the beer with other aromatics gives the mussels a bright acidity that combats the salty flavor that mussels sometimes develop. A dice of bacon brings a smoky quality to the mussels without overpowering. And a generous serving of bread is provided to sop up all the delicious broth left in the bowl. Something that's always easy to scarf down is a big basket of frites (or French fries, if you will, $6 added on if you get mussels). Those served at Ommegang are a classic of the genre. They are cut thick, skins on, fried until just crisp and served with a crackling layer of coarse-flaked kosher salt. Choose two dipping sauces with your frites: aioli (traditional, truffle, basil pesto, or chipotle), spicy Hennepin-spiked ketchup, or Abbey Ale and caraway mustard. Be adventurous with the sauces. 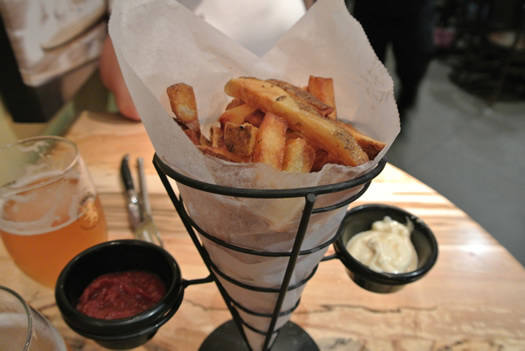 Fries on their own are great, but we all know we order them as a vessel for condiments. One gripe about my meal is that I wish they would toast the bread with the mussels. A little bit of crunch would be a nice texture contrast. The mussels on my last visit were sandy, and my server was quick to attend to the problem. The chef came out to say that sandy mussels have been a problem this summer. I asked other chefs in the area, they agreed there been a bit more grit than usual. Apparently mussels this year are the Bill Buckner of an otherwise impeccable meal. This weekend (July 25-28) is the induction ceremony for the Baseball Hall of Fame's newest class. 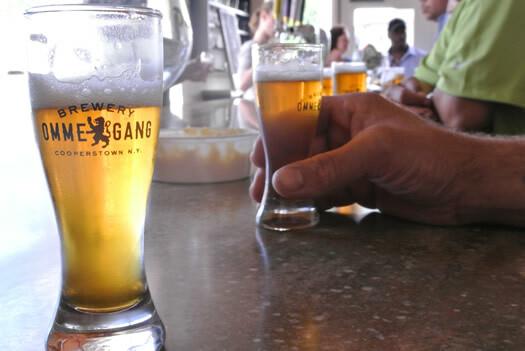 The cafÃ© at Brewery Ommegang is known for filling up fast -- so make a reservation if you plan on heading out to the area for the Hall of Fame activities, or a visit another time this summer (here's a link to Cooperstown tourism info). There are large tables for big parties. Tours of the brewery are available (with tastings) for a marginal fee. The cafÃ© is typically closed during concerts. If you venture out, trust your server to help you with beer and food pairings. You can also opt to sample a beer before committing. As to the fries, well, go all in on those. You won't be disappointed. Indeed, I would go Mookie Wilson on that meal. Oh man, this reminds me that I need to get back to Merry Monk, especially on a Wednesday for their buy-1-get-1 mussels deal. And that reminds ME, that I need to get back to GB 24, especially on Mondays for their $10 mussels special. Best bivalves in the Capital Region, IMO.